travelwithscott Traveling the World, one story at a time. My name is Scott and I like to travel. There I said it, wow that does feel better. There is probably a program for my affliction somewhere. I am what I would consider a Normal Guy. I am a native Arizonan, sometimes we are called “Zonies”. I am in my mid 40′s and enjoy a great life. I am self employed and have a wonderful daughter and Partner. Although I would say my life is a fairly normal one, I am also quite lucky in that I have the ability to travel and enjoy the world, I enjoy learning about other cultures and experiencing the world around us. I want to be right upfront about the type of travel I enjoy and the type I don’t. You will probably not ever read a story of about me backpacking my way through the serengeti during the height of summer, nor will you probably read any stories of me sleeping in the presidential suite of the Ritz Carlton in Paris. I am not a budget traveler, nor am I an uber luxury traveler, I fall somewhere in the middle, where most people fall I believe. I started this blog for the sole purpose of sharing my stories, my views and my excitement for traveling around this world with my friends, family. However it doesn’t stop there for me, I also wanted to make friends with others around the world, those who travel and those who dream of travel. Blogs and Websites evolve over time, mine will no doubt expand over time as well please come back and see what has taken place. However if you have come to my blog to schedule a flight or a hotel, this is not the place. Ah the Blue water of the Mediterranean……. Ever dream of spending a warm summer day in the Cobalt Blue sea of the Mediterranean. Just off the coast of Naples and Salerno, between Cape Miseno and Amalfi, a great rock soars like a dream lost in the cobalt blue sea that surrounds it. This Mediterranean jewel, yearned for and exalted in some of the world’s most famous lyric poetry, is the island of Capri. The intoxicating fragrance of flowers, delicate splashes of color, recollections of a millennial past and a peaceful charm, shattered only by the shrill cry of seagulls, are just some of the magical qualities of this mythical isle. This is one place that needs to be on your Bucket List. 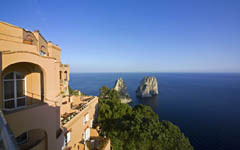 Caesar Augustus was the first to discover the charm of Capri when he visited the island in 29 BC. 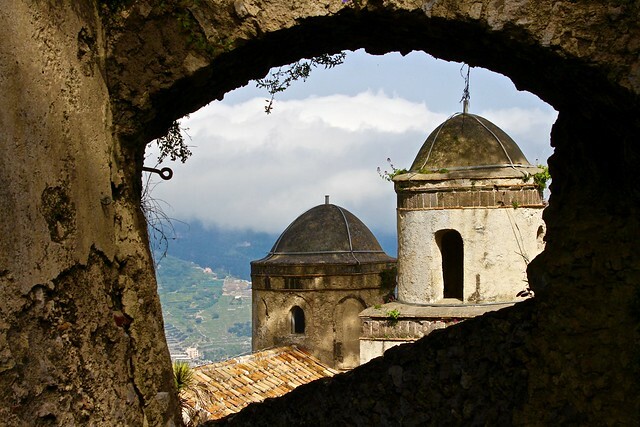 So taken was he with the island’s beauty that he traded the nearby fertile Ischia for it with the city of Naples. This marked the beginning of Augustan rule. He was subsequently followed by his successor Tiberius who embarked on an intense building program between 27 and 37 A.D., resulting in the construction of 12 villas. The island of Capri is composed of two municipalities: Capri and Anacapri, each with their own administration and touch of regional rivalry. The latter is built on a high plateau, affording staggering views of sheer cliffs from dizzying vantage points. The sea emerging below is a very deep, and harsh jagged caves have formed there. The most famous of these is the Grotta Azzurra or the “Blue Grotto”, now known to have been a Roman bathing place. This lagoon is haunted by a dazzling shifting turquoise blue. Small openings in the back of the cave admit daylight which, reflecting on the limestone floor and walls, creates a fantastical and magical atmosphere. It has attracted visitors and inspired awe from all who have seen its ancient limestone walls and learned of the history of this oceanic cave. You will also find the Hotel Punta Tragara dates back to the early 1920’s. when Engineer Vismara built a private villa on the suggestion of the famous French architect Le Corbusier. During the Second World War it was used as the headquarters for the American Command and hosted such famous guests as General Eisenhower and Sir Winston Churchill. In 1968 Count Manfredi bought the villa and turned it into the Hotel Punta Tragara, taking on the management of the property. The hotel is situated right on top of the southern point of the Island, you see Cobalt Blue for miles and miles. 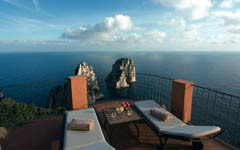 Capri is the home to world travelers and those with unlimited income. There is no doubt that when you arrive to Capri you will witness some of the most spectacular yachts anchored off the coast, soaking up that beautiful Mediterranean Sun. While we were there, we spotted one of the worlds largest, privately owned yachts, The Octopus. Owned by Paul Allen (Microsoft founder). This yacht is 414 feet long, has 2 helicopters, 2 submarines, jet ski’s, pools, you name it, it’s a floating city in itself (you’ll see it in the video below). Suffice to say, I did not get a ride. Capri, is the land of the Rich and Famous and me. 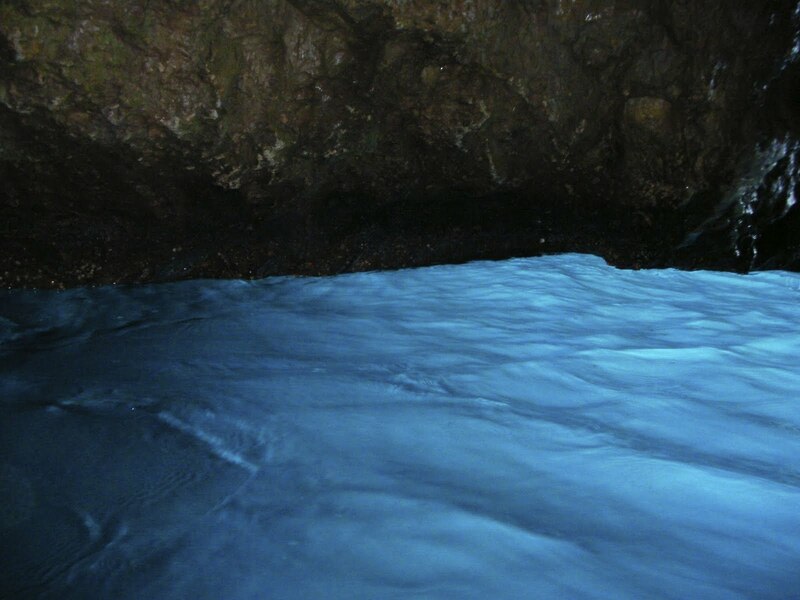 The Grotta Azzurra is a very famous grotto, that glows a beautiful cobalt blue. It is small, and the only way in is to hop aboard a small boat, which will take you inside to view the Blue Waters. As a bonus your “captain” will be more than happy to sing you a lovely Italian Song. 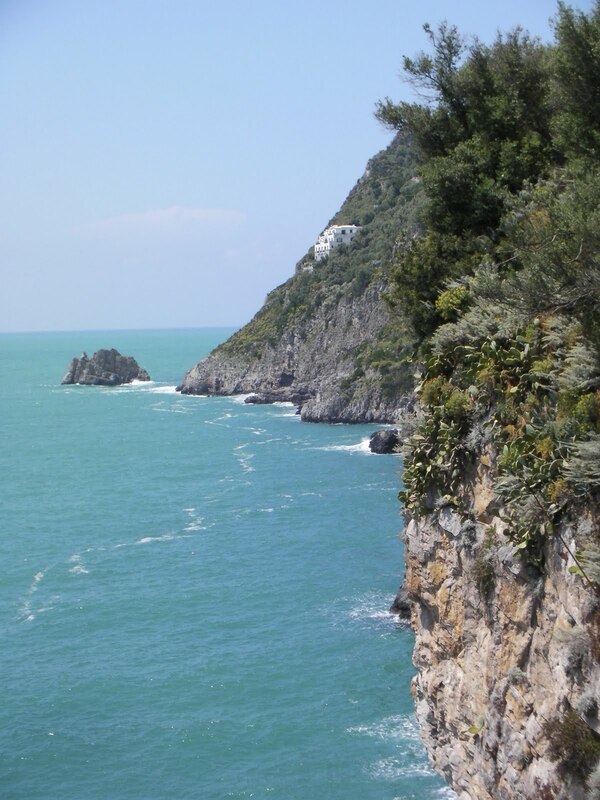 Getting to Capri is not difficult and there are a number of ways to do so. The one way you won’t be able to use, is to hop on a plane and fly to Capri, however if you have the means, you can certainly arrive via Helicopter. Unless you are one of those commanding your own MegaYacht, I suspect you may just want to fly into Naples, and take a taxi to the ferry which will have you on the Island of Capri in no time at all. If your seeking, sophistication, fine Italian clothing and shoes, wonderfully prepared food and all the Sun you can handle, this is the place to go. But whatever you do, take your time, relax and enjoy this piece of beauty. We boarded a private boat with a guide to take us to Capri from our Villa, Villa Maria Pia, high up on the cliffs of the Mediterranean. This is a great way to go, a bit more expensive than taking a ferry, but well worth it. We received a great tour of the small islands on the way to Capri. Once we arrived to Capri, our guide took around the whole island to share with us the numerous caves and grottos along with the overall natural beauty of this Island. The video above is a short recollection of our trip, I hope you enjoy. Become a friend of Travelwithscott on Facebook, just click the “Like” button to your right. ← What type of flyer are you?